The breathtaking landscapes, beauty and mystique of Italy have inspired, captivated and charmed people for centuries — from writers to hikers and beyond. 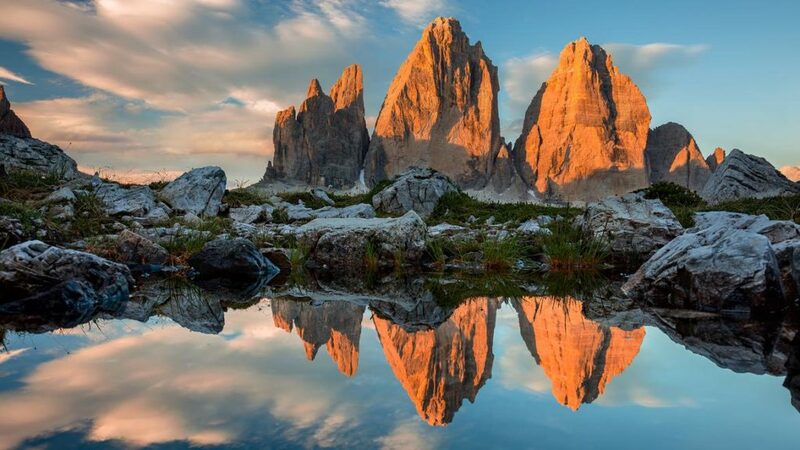 It even prompted Mark Twain to pen that “the Creator made Italy from designs by Michelangelo.” One of the most incredible hikes, well known to trekking enthusiasts, is the Dolomites Alta Via 1 (High Route 1) trail starting at Lago di Braies in South Tyrol, Northern Italy. Whilst making your way through steep valleys, past high Alpine grazing lands or viewing majestic mountains and breathtaking sunsets, this picturesque trip is perfected by the many rustic rifugios along the route, and just as well since camping is forbidden. These little alpine mountain huts offer a warm place to sleep and replenish your energy, whether you’ve chosen a leisurely stroll at medium altitude or a challenging trekking tour amid glaciers and Alpine lakes. They also offer delicious local cuisine so you don’t need to carry extra gear and can better enjoy what will most certainly be an unforgettable, perhaps even Twain’s heavenly, experience! Known as the “Queen of the Dolomites”, Cortina d’Ampezzo is one of the most famous Alpine holiday destinations in the world, and is inserted in the association “Best of the Alps” which lists the most exclusive Alpine resorts from the 5 nations that make up the Alps. The rocky cliffs of the Dolomites that crown the town, like Tofane and Cristallo, represent a dream for every mountain hiker, and the pastures and forests of the Ampezzo basin are the destinations for many fans of mountain sports, or for those who are simply looking for relaxing holidays in one of the most scenic places in the world. And sports aren’t all: Cortina d’Ampezzo is also one of the liveliest holiday places in the Alps. Corso Italia, the city’s meeting place, is always hopping during shopping hours; here you can find shops and boutiques with the best that fashion has to offer, from clothing to jewelry and sporting equipment, not to mention the wide selection of local artisan goods. The Paleonthological Museum “Rinaldo Zardini” – collection of fossils from the Cassian period.